Lately it seems music has stopped evolving—or slowed to a subtle crawl. Where there used to be well defined, bold eras (think disco, punk, grunge, R&B), now is a mixed pot of electronic-accented indie with indie becoming ever more mainstream. The children’s music genre holds onto boundaries a little better with more definitive styles that still largely lean toward the folk/acoustic side. Portland-based Red Yarn is a star of this style and the devotion that Andy Furgeson, the man behind the moniker, has toward reviving traditional folksongs and lyrical tale telling is worth noting. Furgeson is redefining this style ever so slightly, encouraging its evolution. Like an alchemist, he infuses elements of modern sound while holding tight to the constitution under which this folksy music was born. For his third release, Wake Up & Sing, Ferguson journeyed to the Hudson River Valley to see the grounds that inspired some of his musical heroes, from Seeger’s Clearwater to The Band’s Big Pink House in Woodstock. While in New York State, he joined forces with Grammy-winning producer Dean Jones (another musical alchemist), whose influence is recognizable through the variety of eclectic instruments. But the genius behind Jones’s producer mastery is honoring Furgeson’s style and giving him space and encouragement to emit even more electricity. Songs like “Clap Your Hands” and “Fourth of July” are fueled with a mix of classic rock and bluegrass, punctuated by a rollicking banjo. In many ways, Furgeson’s style echoes that of Pete Seeger, a man with an acoustic guitar and a passion for encouraging kids to sing. Seeger came riding the tide of a social landscape that drew strength from community, knowing that there is power in numbers especially when it comes to music. In this environment, singing along isn’t really a conscious choice. The music draws you in with a force that is consuming. Furgeson breaks through in this way as well. His approach is vibrant. It’s passionate. He steps so fully into the lyrical content and traditional stories that he becomes the music. Though Wake Up & Sing features prominent vocals by Furgeson, it toys with the possibility of full stage ensemble with special guest appearances by the likes of Mo Phillips, Morgan Taylor (Gustafer Yellowgold) and Furgeson’s wife, Jessie Eller-Issacs. In his previous two releases, Deep Woods and Deep Woods Revival, Ferguson reintroduced American folk classics from anthologies such as Carl Sandburg’s Great American Songbook (1927) and Alan Lomax’s Folk Songs of North America (1960)—with a balance of light and dark content and a focus on animal perspectives. Wake Up & Sing preserves some animal subject matter but moves into a more playful, sunny arena with the songs retaining a formula that has made children’s musicians like Woody Guthrie, Pete Seeger and Ella Jenkins such celebrated artists. Furgeson knows exactly how to get his young audience to participate through simple, gentle melodies, playful lyrics, and familiar and appealing language. Wake Up & Sing also takes a somewhat more personal detour as much of the album comes from Furgeson’s archives—notebooks of folksong adaptations and rhymes he had written for his son. The tender and original ballad, “Welcome to the World,” is instilled with the staggeringly raw emotion of first-time parenthood and reminds us that song is a powerful mouthpiece for the heart. It articulates the inarticulate moments when your chest swells, throat tightens and eyes well up, overcome by the depth of love and the longing to protect and shield your child from the world. Just when you’re grabbing for the tissues, the song comes back around to comfort not only your child but you as well. Wake Up & Sing is a delightful addition to the Red Yarn repertoire and an album absolutely worth exploring. Its 11 songs offer a sun-moon cycle as it coaxes listeners into a day full of discovery and wonder, gently lulling you back into a sweet little slumber. As Red Yarn, Ferguson has created a style all his own which will no doubt take him on a path to reach the same time-honored status as some of this genre’s classically favored artists including Woody Guthrie, Pete Seeger, Ella Jenkins and Raffi. Wake Up & Sing is available through Bandcamp, iTunes and Amazon. Find additional music and videos by Red Yarn at his official site and stay in touch through Facebook, Twitter, Instagram and YouTube. Shout out to Ryan Bruce for the brilliantly colored vintage linocut print found on the album’s cover. Bonus Material: Families new to Red Yarn should know that there is so much more to this artist. Behind the music is a brilliant stage show featuring a family of puppets (endearingly referred to as “critters”) familiar to many from The Deep Woods albums and productions. Furgeson has also become a staunch supporter of the Portland kindie music community by producing a family music series called The Family Ramble in downtown Portland. This year’s series capped off with a performance by Grammy winning artist Tim Kubart, and will return in the fall. Speak your mind! Free Download: Washington, D.C. by The Not-Its! This year, my daughter Em has become more interested in the election process and political issues. We don’t talk a lot about politics at home. But at school the kids have been discussing it, so when it comes up we roll through Q&A with her. Watching her get passionate and deliver her opinions with gusto makes me proud and motivates me to learn along with her. I want to satisfy her curiosity with more knowledge so that she can continue to form a point of view and her own beliefs. What does all this have to do with music? Well, earlier this week, The Not-Its! released “Washington, D.C.” a single from their forthcoming album Are You Listening? (out this Friday, Feb. 19, 2016). This song rocks! I love that it taps into kid power. Kids want to have a voice, and when you let them speak their minds, they feel empowered. The Not-Its! totally get this and through their music they have found a way to encourage kids to be a part of the action. It’s punk to stand up for your rights! Find your representative / Say what’s on your mind / You can let your voice be heard but you never have to tow the party line / Yeah just hold up your sign / Stand up for your rights / Gather with a scene / You wanna make a change / Rearrange in Washington, D.C. / Now you see what I mean / D.C. do you hear me / D.C. / Are you listening / D.C. / Are you tuned into me. Are you familiar with Love is Walking Hand in Hand by Charles M. Schultz? This is one of my favorite books of all time. No joke. When I was a child, I used to carry it everywhere I went. Even into my teens, that book was always with me. It’s definitely not what you would expect to see a child carrying around but it just spoke to me in the way that only Charles M. Schultz can. Printed on punk rock neon pink and orange pages, Charles M. Schultz’s wacky yet poetically philosophical sense of humor presents a very real discernment of life. He just gets it. Whether it’s joy, love, triumph, anticipation, dancing, singing, mailing a letter, sharing popcorn or walking in the rain, this book covers it all. Each page has a quip and classic Peanuts illustration that appeals to the core of what makes our hearts aflutter. I still own a copy of this book, which is now a vintage treasure I share with my daughter who, having been introduced to Peanuts through the movie, noticed the reference to the little girl with the red hair). In honor of Valentine’s Day, here are some videos – classic and new – celebrating all kinds of ways to feel (the) love, including a bit of Be My Valentine, Charlie Brown. For a more in-depth look at Love is Walking Hand in Hand, check out Brain Pickings’ write up on it which features pages from the book. You know when you hear a song and think “Wow, I really like that!” Say hello to “Pretty Little World,” a refreshing little tune that breathes a heaping spoonful of sunshine into the air. Er, I just realized the artwork features sunshine and a rainbow and well, air, after I wrote the description in the previous sentence. But, as you can see, the image justifiably represents the song! “Pretty Little World” is from the upcoming Michael and the Rockness Monsters self-titled debut album (due out February 2016). The soothing voice you’ll hear is Michael Napolitano, also known as the founder of Preschool of Rock, a music and enrichment program for young children (babies and toddlers). “Pretty Little World” is also available via iTunes and Amazon. In general, I think people consider learning through music as a fun way to learn, and often frivolous. I don’t want to look at what I’m doing with my students always as fun exercises. I think it’s inherently fun because it’s getting the kids to think by using songs as a springboard for a lesson, but the meatiness of the corresponding lessons really challenge and ignite the kids’ thinking. Matthew Baron (the one in the middle of the bottom row) is a Chicago Public School ESL Resource teacher and the founder of Future Hits, a Chicago-based Kindie band and educational project that enhances learning through meaningful songs for children and their families, as well as elementary aged students. At a time where education has come under much scrutiny due to the complexity of the new Common Core standards, Baron has combined his talent as a musician and an educator to produce over 50 songs to date, all of which have served as crucial aids in the classroom. Future Hits’ most recent album, Today is Forever, contains a collection of songs – in English and Spanish – whose educational nature will go unnoticed at first. When I initially played the CD, I was taken by Baron’s voice, which is very similar to Stephen Malkmus’. The lyrics are relatable and I felt an instant connection to the indie sounds of the music. There was no indication that the songs were crafted to encourage proper pronunciation, literacy, phonics and many other divisions of Language Arts and Reading. I have always wanted to be an educator and love hearing about creative ways to use music as a teaching resource. So when Today is Forever crossed my path, I was moved to learn more. I had a great conversation with Baron who goes deeper into Future Hits, as a project and a band while also explaining the many fascinating ways he integrates his songs in the classroom. He also touches upon how Dave Matthews Band encouraged singing, the new album and new curriculum he is working on that will be available online as a .PDF and mp3. Whether you are an educator or parent, or if English or Spanish (or both) is spoken in your home, I highly recommend giving Future Hits a spin. Today is Forever is available through Bandcamp, iTunes, and CDBaby. KCG: Tell us about Future Hits? Matthew Baron: Sure! I am an ESL Resource teacher, and Future Hits is a project I started as a way for me to come up with lessons that meet the needs of all types of learners. In March 2011, I was in an alternative Masters Program for Education, and one of my key assessments was based on an in-classroom assessment. A first grade teacher who had a group of ESL students in her classroom gave me her class’s spelling words for the upcoming week, which contained long “o” words featuring “oa” and “ow” spelling patterns. With 10-12 feature words in front of me, I decided to write a song called “Yellow Boat,” which ended up being on our first album, Songs for Learning. During my assessment, I brought the song and a lyric sheet to the classroom, and gave the kids a spelling quiz. It was a smash! My assessor loved it, the teacher loved it, my administration loved it, and they all encouraged me to continue to do similar songs and exercises. At times I let kids illustrate their comprehension. So if a kid is young or has writing challenges or doesn’t know English yet, they can draw what they hear from the song first as opposed to writing it. This is an effective and joyful modification for diverse learners and English-language learners. KCG: How did you decide on the name Today is Forever for your second album? KCG: Your previous career was in Sales. Going from Sales to Teaching, how would you describe your experience as an educator? A friend and mentor of mine told me while I was still in my education masters program: “Being a teacher isn’t just about having interesting conversations with students, you have to actually teach to the standards.” I look at my role as an educator as not necessarily doing interesting things with kids as a first priority. My first priority is to teach them what the state and the country standardizes. I think about how I can teach kids in an interesting and impactful way. In general, I think people consider learning through music as a fun way to learn, and often frivolous. I don’t want to look at what I’m doing with my students always as fun exercises. I think it’s inherently fun because it’s getting the kids to think by using songs as a springboard for a lesson, but the meatiness of the corresponding lessons really challenge and ignite the kids’ thinking. KCG: How do you cover making music for families versus writing for your students? Is it hard to separate the educator part of yourself versus artist/musician? When I write music for kids, I take a look the focus words (word families and vowel sounds mostly) I get from the general classroom teachers, sometimes there are 10, sometimes 20, I look at them on a page and think “what could this song be about?” For example, a new song on our yet to be released 2017 album is called “Mood Change,” and It teaches about long u (“ue” and “oo”) words. Solely based on the focus words I got prior to writing the song, it occurred to me that this could be a song about a kid who’s feeling depressed after school and what he can do to feel better. So it has a general appeal. It’s one of my favorite Future Hits songs because it’s based my experience as a kid and an adult; it explains how I think negative thoughts, and how I must act to get myself out of that thinking. KCG: Does that process shift when you write specifically for students, and with the Common Core Standards in mind? I start as a means of simplicity to help students understand sounds and then work with the focus words. Once I have the first iteration of a song, which incorporates the focus words, I think about how I can write lessons that go along with it, and that can help me teach to Common Core standards. In “Mood Change” I thought through how I could talk about settings that affect a child’s mood, like being at the library, pool, or zoo, and that wasn’t intentional. My only intention was to talk about double o words, and the short double o sound, which is pronounced “ouhh” as in “look” and “cook.” Then I added in a lot of double o, long o sounds like “oo,” as in “zoo” and “pool”, which allows me to use the song in an expanded way in terms of kids differentiating the sounds that “oo” can make. I always tell them that the English language is very strange, and unlike Spanish, has very few rules, so we must remember why letters sound the way they do in every particular word. KCG: In addition to encouraging pronunciation, what other Common Core standards do your songs address? The songs have also worked to support key Common Core areas such as inferences and figurative language. Our song, “On Stormy Mornings,” for example, has literal lyrics (“On stormy mornings / I get a late start”) and figurative ones (“My room is so dark / I sleep like a rock”). That line is also an idiom, something that is essential for ESL students to learn. Altogether those three things are where I align to different Common Core standards and different writing levels. This is what’s so great about being a resource teacher; I never considered literal or figurative language for “On Stormy Morning” until a teacher said we’re doing literal and figurative language and asked if I had any songs that would work to teach this. One day, I did an exercise with my students that I didn’t intend. In “On Stormy Mornings,” the word “parched” appears. The lyric goes, “My mouth is so parched / before it gets wet.” The kids didn’t know what the word “parched” meant, so we broke down the exercise. I only had them read that one line, “My mouth is so parched,” and then we sang it once. I explained to them that if they aren’t familiar with what a word means, a great reading strategy is to read around the word they are not sure about. I told them that to read a little before the word or a little bit after to gain better understanding. Together we then looked at the next line “But before it gets wet,“ and a girl’s hand shot up and she said “Parched means dry!” I asked how she knew that, and she said “Well, before my mouth gets wet, it’s dry.” So that’s Common Core-aligned strategy, letting kids gain strategies to read text closely to gain richer understanding. This turned out to be a great unexpected lesson. KCG: SEL (Social Emotional Learning) is also a hot topic. In my daughter’s school they have specialists come in to teach various aspects and scenarios to the kids to encourage better interpersonal (and personal) experiences within the classroom and outside of it, like on the playground for example. Does you also write songs that align to SEL standards? Each song has an SEL standard affixed to it, and can be used to teach SEL in a real way that aligns to standards. How the SEL standards arise is from working backwards. For example, I don’t say I’m going to write a song about honesty. Instead, I look and see that there is a standard about trust or honesty, and I think about how a particular song I’ve already written can express the meaning of trust. This makes the process more simple, instead of having all of these parameters around how a song must be in order to meet educational goals. I can look at each song and notice at least one SEL theme, and from there I find actual standards and use the songs to teach them. KCG: Do you consider Future Hits to be an educational band? I was very intentional about having Today is Forever straddle both elements of the band’s goals, which is to be an educational band, and also to be a band that people can enjoy whether or not they are tapped into the educational component. The title of our first album, Songs for Learning, is sort of a wink and homage to Brian Eno’s Music for Airports because I was listening to that album a lot around the time I was working on that album. With Today is Forever, we’re a little less overt with the educational nature of this album. For example, on the back cover of Songs for Learning, there are asterisks that denote how songs are aligned to Common Core and social emotional learning, whereas with Today is Forever, we put the educational charts in the liner notes. Aligning our songs to educational standards is essential for us, but I wanted to convey that the record can stand alone as an album that people can listen to and not necessarily use just for educational purposes. KCG: Why do you describe Future Hits as “the heartfelt (yet secretly educational) music project for kids, families and teachers”? It seems like “secretly educational” is a disclaimer to avoid any stigma or disapproval from the general public about what your music might sound like. 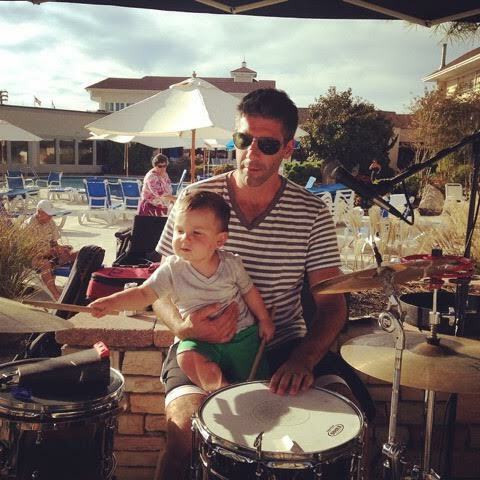 PA-based kids’ musician, Alex Mitnick of Alex & the Kaleidescope, will soon welcome a second baby into his family. When Alex became a father for the first time with his son Miles (now 2-years-old), he was so overjoyed that he wrote an entire album, Love Songs for My Baby, which he released as a solo album in 2014, which is just so sweet and soothing. One thing I have always been fond of with Alex, whether solo or with his band, is his soothing voice, uplifting energy and the multi-cultural aspect of his sound. Alex has since moved on to become the producer of his own TV program for children which takes kids around the world with clips filled with rich educational content, and music videos. A new Alex & the Kaleidoscope album, Get On Board, will be released on October 9, 2015. Keep up with Alex through his official site, Facebook, and Twitter to find out how you can get your hands on a copy of Get On Board. In the meantime, check out Alex’s music through his official site. 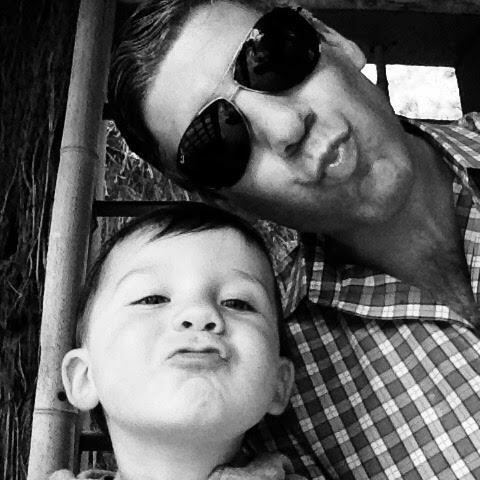 Get to know this Dad who rocks with some additional Father’s Day Q&A where Alex shares about how being a parent continues to inspire him, while also providing a successful path that continues to fuel his creative path. Also check out a sweet Father’s Day video for “Feelin’ Fine,” which was written in honor of Alex’s son, Miles. KCG: What does being a Dad mean to you? AM: I have always felt deeply connected to children and to all that they represent in terms of our human potential. Their immense capacity to learn and absorb information, their honesty and ability to love both people and the world around them and the way that they truly live in the present moment at all times has been the inspiration for my work as an entertainer and teacher for my entire adult life. Becoming a Dad affirmed all of this and truly completed the circle of my life as a children’s artist. I believe more than ever that the best way to create a better world for us all is to lift our children up and to show them by example how truly amazing life can be. Let’s face it, life is really hard, but, every minute spent with my son is another chance to be positive, patient, loving, and fun and I am grateful for each and every one of those moments. KCG: How has your work as a musician/artist been impacted by your role as a father? Also, if you are a touring musician, how does that affect the time you spend with your family? AM: I’m now not only a producer of kid’s media but also a consumer and can see more than ever the value of truly high-quality experiences for my son. As a consumer I am always looking for entertainment that balances stimulation and fun with intelligence and sensitivity to the developmental needs of children. I cannot help but to think about these things as I write new songs, perform live concerts and produce more episodes of my TV show. So, now, as a parent, I am basically creating the music and video that I want my own children to consume. In terms of balancing the musician life with family life it is a challenge for sure but I am grateful for the support of my wife and extended family without whom I couldn’t keep working as hard as I do. AM: I don’t have specific plans yet (at least none that I know of) but I’ll be very happy to turn off my phone, close my computer and spend the entire day with my wife and son doing something fun together as a family. KCG: What is one of the most memorable moments you’ve had as a Dad? AM: Wow. This is a hard question to answer with a single moment! My son is about two and a half now and witnessing the language explosion that is happening to him is truly amazing. It’s not so much the vocabulary itself but all of the little nuances and funny inflections of his voice that are clearly his own unique expressions. Watching him become his own little person is truly mind blowing. KCG: How often to do you play music with your son? Does he perform with you? AM: Every day! Whether it’s tapping on the steering wheel or having my son at one of my concerts or simply singing a few songs before bed music is a big part of our family’s everyday life. My son doesn’t perform with me but he loves to get on the mic during sound checks and sing songs! It’s hilarious. My opening act!